Our client, an arts and crafts retailer with multiple store locations throughout the Northeast, had a website that featured a variety of offers that a customer could print out and take into a store—but it didn’t capture any data. Without capturing an email address or mobile number, there was no way to link that offer to an individual customer. Additionally, the client found that customers wanted a more modern and convenient solution than a printed offer. Clutch powered a Send to Phone option on the client’s website where customers could choose to provide their mobile number in the modal, which triggered the offer to be sent via mobile message. Our client acquired new subscribers at this stage with a mobile opt-in checkbox. Using historical coupon data, our client set a goal of 400 redemptions in 30 days. Our solution drove 60X the goal, with 25,000 redemptions in the first month. The platform managed channel-specific barcodes for our client’s mobile and print offers, allowing them to track spend by channel. The outcome revealed a 10% higher AOV for shoppers who utilized mobile offers. 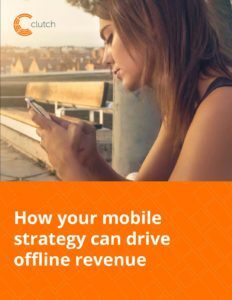 Mobile was a new channel for the client, and in just the first six weeks, they could attribute 7% of their revenue to it. 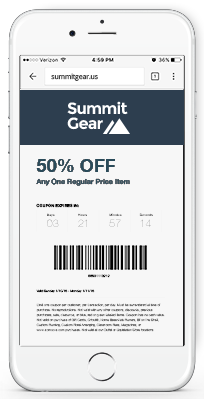 With a fast setup and minimal resource requirements, this Send to Phone use case can be adopted by any retailer with a website. Read the full case study to learn how Clutch can help grow revenue and drive store traffic for your brand!